We start off our top 10 with arguably the best looking tier 1 set ever to be launched with the game; the Shaman Earthfury. This set offered a glimpse into what was to come for Shaman who have over the years been given a lot of love by the Blizzard art department. 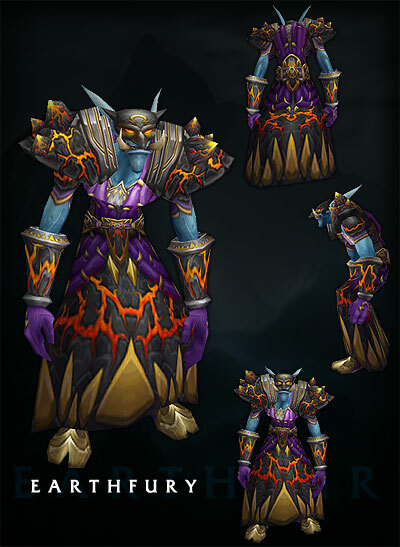 From lava streaked shoulders to fire brimmed kilts, this set delivers and is one the reasons that historically many regard Shaman as the treated class in terms of the visuals. Those same masses will also be the first to tell you that the developers and their class balance have not always shown the same kindness or favoritism. This entry was posted on July 13, 2011 at 11:31 pm and is filed under General, HFL, MMO, Raiding, Role Playing, World of Warcraft. You can follow any responses to this entry through the RSS 2.0 feed. You can leave a response, or trackback from your own site. Awesome set, awesome site, awesome podcast. keep it up Armada!